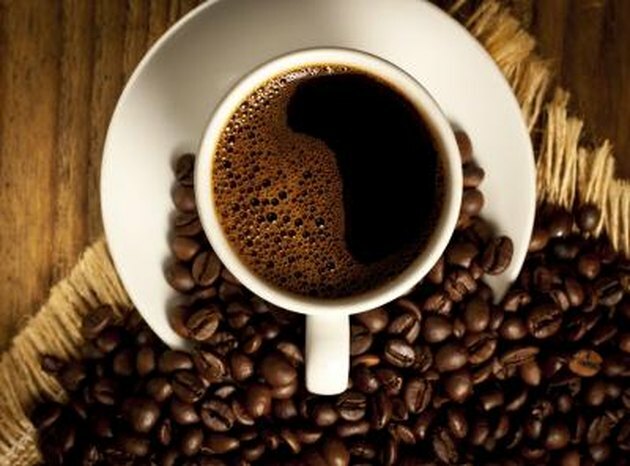 Caffeine is a stimulant molecule found in coffee, tea, and many sodas. While it's popular as a pick-me-up and increases attention and alertness, it may also have a negative effect upon your ability to become pregnant or in developing a healthy baby. Consider avoiding caffeine during pregnancy, particularly during the early weeks. One of the odd aspects of pregnancy is that medically, it's dated from the first day of your last menstrual period, explain Heidi Murkoff and Sharon Mazel in their book "What To Expect When You're Expecting." This means that the first two weeks of pregnancy, from a medical standpoint, refer to a period of time during which you're not actually pregnant -- the time between your last period and when you ovulate. However, in popular parlance, the first two weeks of pregnancy refer to the very early period of time following conception and including implantation and early embryonic development. Regardless, both are very sensitive periods with regard to conception and development. Caffeine is classified as a sympathomimetic, which means it stimulates the "fight or flight" portion of the nervous system. Caffeine consumption has effects upon your brain function, which is why it increases your feeling of alertness, but it also increases your heart rate and produces changes in blood flow. Further, caffeine has the ability to cross the placenta and, prior to placental development, to pass from mother to developing embryo, note Drs. Michael Roizen and Mehmet Oz in their book "You: Having A Baby." The first two weeks of pregnancy, as defined medically, occur before you conceive. Caffeine during this period of time is ill-advised because it can reduce your risk of conception, notes a study published in the scholarly journal "The American Journal of Epidemiology." Women who consumed more than 300 milligrams of caffeine each day had a 27 percent lower conception rate than non-users, notes the study. Even low-to-moderate caffeine users had a 10 percent lower risk of conceiving relative to non-users. As such, you should avoid caffeine if you're trying to conceive. Popularly defined, the first two weeks of pregnancy occur after you've conceived, but generally before you know you're pregnant. During this time, the developing egg divides several times, travels to the uterus, and implants. This is one of the most sensitive periods of pregnancy, as there's a risk of the developing embryo failing to implant, which results in an early miscarriage. Drs. Roizen and Oz note that caffeine users typically experience higher rates of early miscarriage than non-users, with heavier users at the greatest risk. Can I Drink Oolong Tea During Pregnancy?